I can't seem to figure out how to install the Oracle client on Windows Server 2008. Which executable should I run? The instantclient works only by defining the folder in the windows PATH environment variable. But you can "install" manually to create some keys in the Windows registry. How? 2) Unzip the ZIP file (eg c:\oracle\instantclient). 3) Include the above path in the PATH. 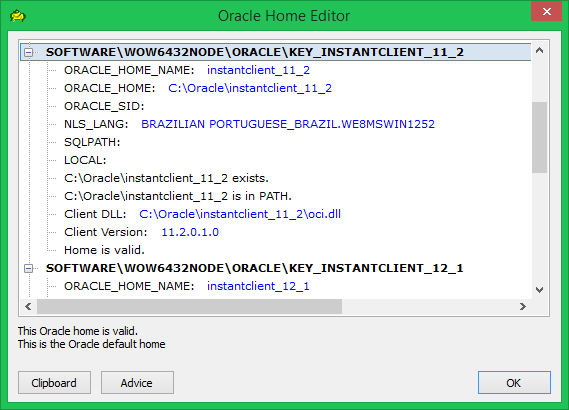 I was able to setup Oracle Instant Client (Basic) 11g2 and Oracle ODBC (32bit) drivers on my 32bit Windows 7 PC. Note: you'll need a 'tnsnames.ora' file because it doesn't come with one. You can Google examples and copy/paste into a text file, change the parameters for your environment. Put contents in folder like "C:\instantclient"
Edit PATH evironment variable, add path to Instant Client folder to the Variable Value. Add new Variable called "TNS_ADMIN" point to same folder as Instant Client. I had to create a "tnsnames.ora" file because it doesn't come with one. Put it in same folder as the client. reboot or use Task Manager to kill "explorer.exe" and restart it to refresh the PATH environment variables. Copy all files into same folder as client "C:\instantclient"
- All files (Client and Drivers) needed to be in the same folder (nothing in sub-folders). - Running the ODBC driver from the command prompt will allow you to see if it installs successfully. Double-clicking the installer just flashed a box on the screen, no idea it was failing because no error dialog. After you've done this you should be able to setup a new DSN Data Source using the Oracle ODBC driver. -Hope this helps someone else. Download the appropriate Instant Client packages for your platform. All installations REQUIRE the Basic package. Unzip the packages into a single directory such as "instantclient". Set the library loading path in your environment to the directory in Step 2 ("instantclient"). On many UNIX platforms, LD_LIBRARY_PATH is the appropriate environment variable. On Windows, PATH should be used. Start your application and enjoy. Suggest extracting/unzipping into a new directory. They've suggested instantclient, but you can name the directory anything you like. Name it C:\OracleInstantClient\ if you choose. If you want to use SQL Server Management Studio, you want to install the full Oracle client, not the Instant Client. The full Oracle client is on the same download page as the Oracle database. Assuming that you are installing on a 64-bit version of Windows, I expect you want the "Oracle Database 11g Release 2 Client (11.2.0.1.0) for Microsoft Windows (x64)" download. This is several hundred MB rather than a couple of MB for the Instant Client. Not the answer you're looking for? Browse other questions tagged oracle install or ask your own question. Error while connecting to Oracle Server from Instant client through CMD prompt, but SQL Developer connects?